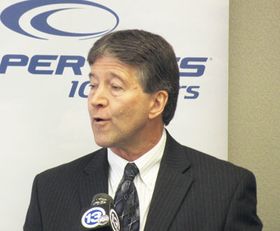 FINDLAY, Ohio—Cooper Tire & Rubber Co.'s plans for a Global Technical Center are back on track after being delayed for a year by the firm's proposed merger with Apollo Tyres Ltd. The $35.5 million Global Technical Center will be located at Cooper's headquarters in Findlay along with its existing North America Technical Center. It ultimately will employ 40 scientists and engineers and is expected to be operational by year-end. The tire manufacturer originally announced the global tech center in February 2013, receiving approval from the Ohio Third Frontier Commission for a $2.8 million grant as an industrial research and development program. However, after plans to merge with Apollo were disclosed in May, the project was put on hold. “We put the Global Tech Center on pause while we took stock of what the combined company technical assets were going to look like and how best to structure and execute our technology innovation capabilities under a new combined entity,” Roy Armes, Cooper chairman, CEO and president, said during an event June 23 in Findlay to mark the official announcement of the GTC. Cooper terminated its proposed merger with Apollo in December. “With the merger behind us, we promptly went back to our original plans for the global tech center,” Armes said. The GTC will have a dedicated research and development team, Cooper said, focused on exploring areas such as nanotechnology and new polymers and compounds. The center will be under the direct leadership of Cooper's Global Technical Center Director Curt Selhorst and will support Cooper's NATC as well as the regional technical centers of its subsidiaries—the recently opened Asia Technical Center in Kunshan, China, and the Europe Technical Center in Melksham, England. With technical centers on three continents, Cooper had several options of where to construct its Global Technical Center. In the U.S. alone, many states are competing for this kind of business, Armes said, as well as several countries. Cooper has a rich history in Findlay, he added. Other places could have been good, he said, but everything pointed to Findlay, especially with Cooper's partnerships with local organizations, such as universities and NASA. Findlay partners with companies by creating an “environment that's conducive for a productive investment. So when you're deciding that you want to actually put $35 million into a community, you want to make sure it's a safe community. That it's an environment that's economically friendly, and we feel we provide that environment for companies like Cooper Tire, and we look forward to their success well into the future,” she added. 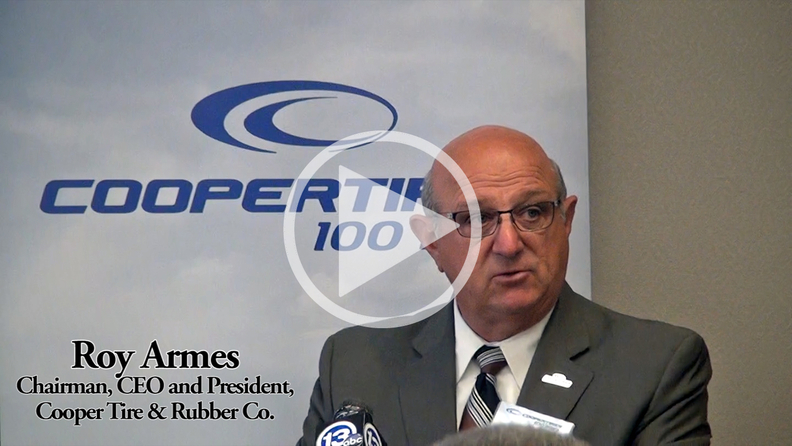 David Mustine, senior managing director at Jobs-Ohio, expressed his gratitude for Cooper Tire selecting Findlay as home to its global technical center. Armes said that 30 percent of the company's revenue comes from new products, which Cooper defines as developed and introduced within the past two years. “Essentially, we are talking about having the right tools in the tool box to expedite product development cycles and the knowledge to use them effectively when we need them,” he said. This enables the tire firm to develop products quickly and efficiently. The company's three strategic focuses are technological leadership, global leverage and superior customer value. With these focuses, Cooper aims to continue to launch world-class products, invest in selective innovative technologies and be an efficient tire technical organization, Yurkovich said. Cooper is working on innovation technologies, such as lightweight, fuel-efficient tires and the development of a domestic source of natural rubber. Cooper has been awarded government grants in excess of $8.4 million by the U.S. Department of Energy and the U.S. Department of Agriculture, he added. “Another focus area for the Global Technical Center is research in the science of tire mechanics and materials physics,” Yurkovich said. The Global Technical Center will communicate this new technology directly to its three regional tech centers around the world, Yurkovich said, and also will embed the knowledge they learn into development tools. “By providing engineers who develop our products with better tools, we will enable them to do a better job, a more effective job,” he added. Cooper plans to hire engineers and scientists with advanced degrees and various backgrounds to assist in these research areas. Armes said the hiring process already has begun, and Cooper is looking to hire 40 employees over the next three to five years. Do you have a question you hope to have addressed in the webinar?